Dr. Kurtzman provides patients with comprehensive dental services including family dentistry, cosmetic dental care, sleep dentisty and he specializes in working with patients who have special medical needs. Dr. Kurtzman utilizes state-of-the-art dental technology and dental procedures in order to help his clients maintain healthy, attractive looking teeth. When you step into Dr. Kurtzman's dental office, you will find a warm environment and friendly surroundings. Our team is committed to building a long-term relationship with you. Your dental visits will start off with a comfortable, sincere discussion about your dental needs. Our dental service includes a diverse selection of dental care techniques such as cosmetic dentistry, restorative dentistry and general family care. Below you will find the specific dental services we offer. During your initial visit, we will provide you with a comprehensive initial oral examination. This initial exam includes x-rays, a cancer screening exam, a periodontal (gum) exam, tooth exam, diagnotis models and photographs. This gives us a thorough understanding of your current health status. As a result, we provide you with a diagnosis and recommend dental treatment. For a new type of dental experience, call Dr. Kurtzman today! When it comes to dentistry, our ultimate goal is to make sure all of our clients feel comfortable as possible. 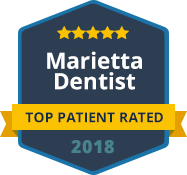 For additional information about our dental services, please feel free to call or contact our Marietta Dentist office to schedule your appointment (770) 980-6336. Our friendly staff will schedule your appointment to discuss your individual dental needs. When you have a dental emergency and you desire pain free dentistry, Dr. Kurtzman is the right choice!